The pdf of the Guidelines can be downloaded here. These guidelines are part of the comprehensive Preservation Guidelines I wrote about previously. Building a new home within the boundaries of a Houston Historic District has always been challenging…a guessing game. What is allowed and not allowed? The only way to know is to present your plans and see if they are approved. If not, you get suggestions and try again. 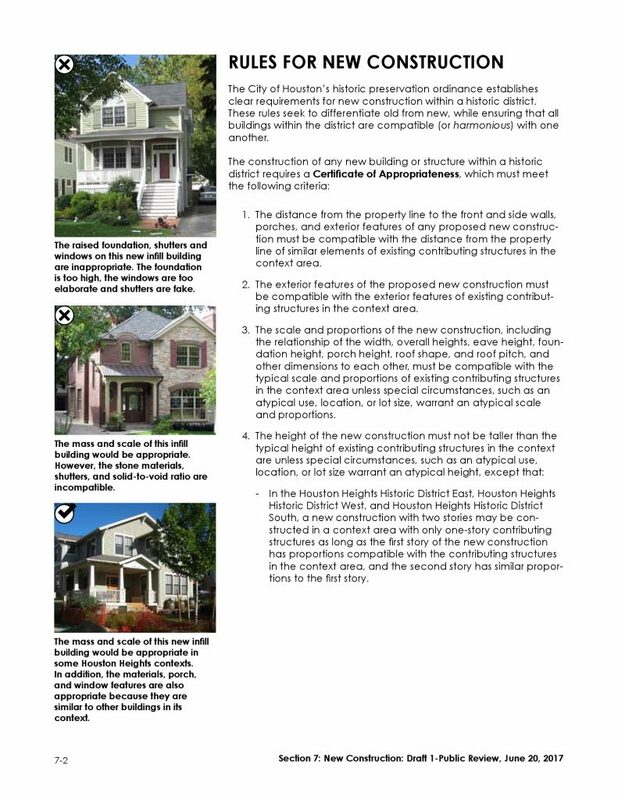 The image below is just one page of the 18 page Guidelines for New Construction proposed for Houston Heights Historic Districts. The page above was taken from the 18 page guideline for new construction. It shows the requirements needed to get the Certificate of Appropriateness to build in a historic district. Some of the Design Guidelines are qualitative; subject to interpretation. Others are quantitative; you either meet these guidelines or you do not. Some of them keep a building from looming over other homes: Eave Height, Building Wall Height, Garage Ridge Height, Front Wall Width and Offsets, Side Wall Length and Offsets, Porch Eave Height. The esthetics of porches are considered too: Front Porch Width and Depth. If you are a builder, architect or home designer in the Heights, this should be your bible. These guidelines are a draft. They are to be presented to residents of of Heights on June 20th, at the Heights Fire Station. A quote from the guidelines shows what they hope to achieve in new construction. — encourage new buildings and additions to look new. still easily identifiable as new. See my page on Heights Historic Districts for maps and descriptions.